The reintroduction of wolves into Yellowstone National Park is tied to the recovery of aspen in areas around the park, according to a new study. The study was published today in the journal Ecosphere. This is the first large-scale study to show that aspen is recovering in areas around the park, as well as inside the park boundary, said Luke Painter, a wildlife ecologist at Oregon State University and lead author on the study. Wolves were reintroduced to the park in 1995. The study shows their predation on elk is a major reason for new growth of aspen, a tree that plays an important ecological role in the American West. Wolves are culling the elk herd, adding to the effects of bears, cougars, and hunters outside the park, which means less elk are browsing on aspen and other woody species. The presence of wolves has also resulted in most of the elk herd spending winter outside of the park, Painter said. Before wolf restoration, even when elk numbers were similarly low, most of the elk stayed in the park. "What we're seeing in Yellowstone is the emergence of an ecosystem that is more normal for the region and one that will support greater biodiversity," Painter said. "Restoring aspen in northern Yellowstone has been a goal of the National Park Service for decades. Now they've begun to achieve that passively, by having the animals do it for them. It's a restoration success story." Elk numbers in northern Yellowstone have declined from a high of nearly 20,000 in 1995—the year wolves were restored to the park—to 7,579 counted over two days in January by biologists with Montana Fish, Wildlife, and Parks and Yellowstone National Park. 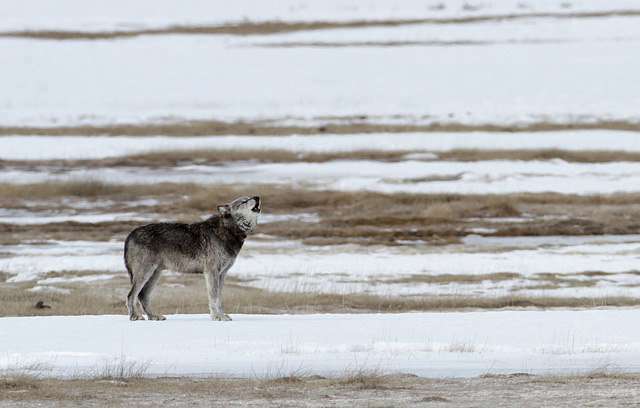 The study answers the question of whether the return of wolves to Yellowstone could have a cascading effect on ecosystems outside the park, Painter said, where there is much more human activity such as hunting, livestock grazing, and predator control. There has also been skepticism surrounding the extent and significance of aspen recovery, he said. "We show that the recovery of aspen is real and significant, though patchy and in early stages, and occurring throughout the region where elk population densities have been reduced," he said. "Also important is that the regional distribution of elk has changed, and not just their number, and this is reflected by young aspen growing taller in winter ranges in and near the park. Meanwhile, elk densities have increased farther from the park. Other factors besides wolves affected elk, but wolves played an essential role in these changes." The researchers surveyed aspen from 2011-2015 in three winter ranges in the Yellowstone region. They compared that data to aspen surveys in 1997-98 in the park's Northern Range, Gallatin National Forest Northern Range, and the Sunlight/Crandall Range, which provided a baseline for aspen conditions when wolves were beginning to colonize these areas. They found that if elk densities were greater than about four elk per square kilometer, aspen were heavily browsed and suppressed. Elk densities in the Yellowstone region were generally greater than this prior to wolf reintroduction. With high elk densities, starvation was common and elk ate whatever was available, but with lower elk densities their effects are not so uniform, allowing for a patchy reduction in browsing and release of young aspen to grow taller. "Our findings represent another piece of the puzzle as we're trying to understand the role of predation in the ecology of the Rocky Mountain region," Painter said. "Much of the research ecologists have done has been in the absence of non-human predators. Before the reintroduction of wolves, most experts didn't think it was going to make much difference for aspen. Wolves didn't cause aspen recovery all by themselves, but it is safe to say it would not have happened without them."